Where Do Our Tuition Dollars Go? 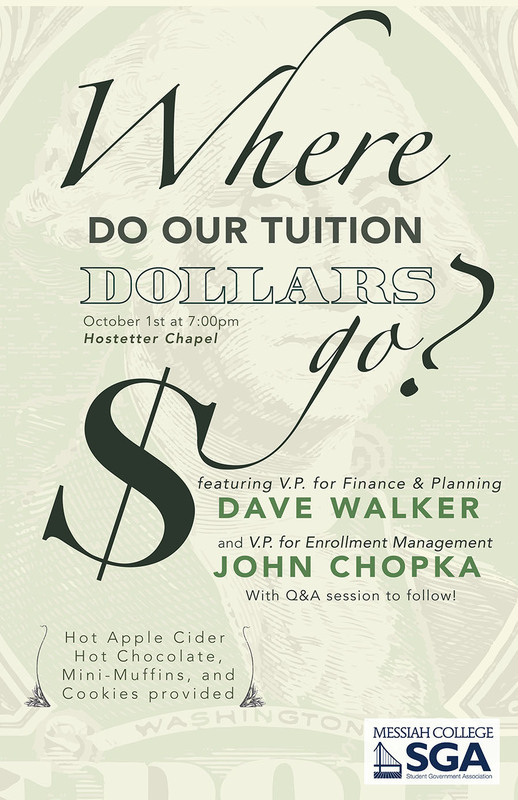 On Monday, SGA hosted “Where do our tuition dollars go?” featuring V.P. for Finance and Planning Dave Walker and V.P. for Enrollment Management John Chopka. The event was planned in response to SGA V.P. of Finance Logan Buffington noticing a gap in students’ understanding of the finance behind the scenes of Messiah. Chopka prefaced the conversation with some preliminary background on tuition. In the past years, Messiah has seen an increase in commuters, transfers, and graduate students. Messiah is currently focused on recruiting and retention. Since 2013, there have been 71 new scholarships. A majority of this scholarship money comes from donors who request that their donations go directly to students. So where DO our tuition dollars go? “A significant portion goes to clubs, clubs, and more clubs!” said Buffington. Club finances can be used for travel, supplies, refreshments, registrations/memberships, speakers/venues/contracted services, and printing. These fees for various clubs and organizations on campus provide opportunities for students to experience dances, game nights, socials, educational forums, movies, retreats and more. In addition to clubs, 36 cents of every tuition dollar go to the classroom, 19 cents go to student support (library, computer lab, etc.) and roughly 10 cents go to athletics. President Kim Phipps noted that many of these long-term projects arose from tangible needs. For instance, music majors used to struggle to find places to practice before the implementation of private practice rooms. The idea for high center renovations was conceived in 1998, and fundraising was completed in 2012. If any students are interested in continuing the conversation regarding finances at Messiah College, a great place to start is Phipps’ open door day this upcoming Tuesday, Oct. 9, at 1 p.m. Her office is on the second floor of Old Main and she is always willing to talk to students. More information on topics discussed at the meeting can be found here: https://www.messiah.edu/info/21065/research/1662/fact_book.